The Most Versatile Power Entry Module Yet » Electronic Salesmasters Inc.
SCHURTER launches its most versatile power entry module, series DG12, extending its DG11 series to include a mains filter. The new PEM integrates an IEC inlet, circuit breaker, mains filter – with optional IP protection. 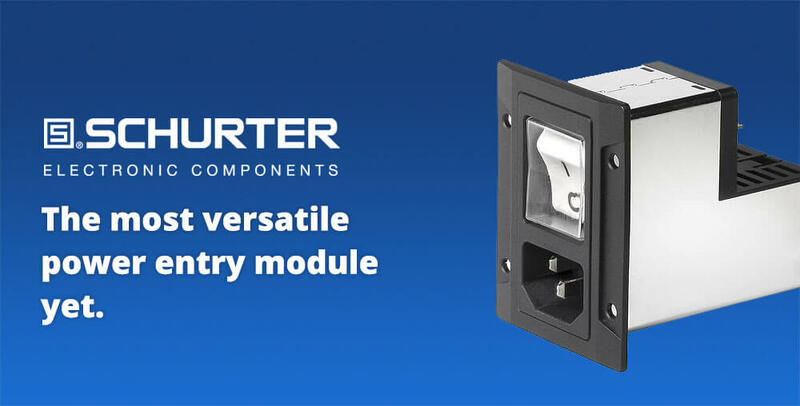 The extremely compact design with its multitude of features, consolidates discrete power components into one space-saving unit suitable for a variety of applications. The DG12/DG11 features a recessed 2-pole ON/OFF rocker switch circuit breaker with 1- or 2-pole overcurrent protection. Various colors and markings for both illuminated and non-illuminated switches are available. Current ratings range from 0.05 A to 15 A. The IP67 unit features a circuit breaker with a factory mounted seal cover and frame with inlay gasket, designed to mount tightly to the front panel with sealed screws. Mounting options include snap-in, 1 to 3 mm; screw-mount, front or rear panel with top/bottom or side flange. The DG12 features a standard and low leakage mains filter, as well as standard and higher inductive performance options. The filters are available in current ratings 1-10 A at 250 VAC according to IEC and 15 A at 250 VAC according to UL/CSA. The filter series is available in standard or medical versions for Protection Class I and II. Applications include IT or telecom systems according to IEC 90650, and medical devices according to IEC 60601-1. The series is compatible with V-Lock cord retention connection cables. We are honored to serve as a manufacturer’s rep for SCHURTER, a leading partner for passive electromechanical components (fuses, circuit breakers, connectors, EMC filters and input systems).